Today I'm taking a little break from the regular political stuff you've gotten used to reading here to pay homage to Larry Moore, a man who had been my best friend for more than a half century. No man ever had a more loyal friend than I had in Larry Moore. Five years ago today, December 19, 2003, my best friend since we both were five years old passed away as a result of injuries he received in a motorcycle accident on a lonely desert road near the California/Nevada border early in November of that year. He was on his way home from Las Vegas after a visit with friends and decided to avoid the busier, more dangerous interstate highway and take the road less traveled. We'll never know what caused his accident, although we can speculate that he just momentarily lost focus and didn't see a clearly-marked turn coming up. Whatever the cause, he ended up in a crumpled heap on the side of the road and would have died on that spot if not for the fortuitous arrival and quick action of foreign tourists immediately after the crash. They flagged down a railroad work crew, who used their training and wisdom to call the right people at the right time and my friend was helicoptered to the University Medical Center in Las Vegas - the best trauma center in the western United States. For six weeks he received the best possible care from the staff in the Trauma Intensive Care Unit. His injuries were so severe - it was as though he had been beaten with a baseball bat - that the staff juggled treatment with skill to first keep him stable, then to bring him back to us. They almost succeeded. Finally, after six weeks, an untreatable blood clot took him from us. During the month and a half my friend was in the hospital I was at his side, making decisions about his care as required by my designation as his power of attorney for health care. Together, my friend and I rode a roller coaster. Time after time he would rally, then regress. Each night I would return to my hotel room and report via email to friends who were eager for good news. At first there were just a few, but near the end hundreds of people received those nightly reports, each looking forward to reading a glimmer of encouragement. Right up to the end we had hope, and were making plans for his rehabilitation. Sadly, it was not to be. During my time at his bedside I had a chance to contemplate our lives together, and how much we each meant to each other. Growing up as friends, closer than some brothers, we shared our lives. Our birthdays were two weeks apart, so we celebrated together whenever we could. We attended some of the same schools, were Cub Scouts and Boy Scouts together. We dated the same girls, were teammates in college, reveled in each others accomplishments and agonized when things were not going well. He was my best man at my wedding. My wife and I are god-parents to his youngest daughter. In our youth Larry used to compose and perform songs - even though he couldn't read a lick of music. I remember sitting in his tiny bedroom as he would hammer out his latest creation - usually a ballad of sorts dedicated to his current girlfriend at the time. He was pretty darn good at it, too. He formed a band that performed at local venues and actually cut a couple of records. In fact, if you do a Google search you might find the lyrics of his song, "Hooray for Weekends" out there in the ether. One night he was the opening act on a local television show when a couple other young musicians, who were just getting started, performed. You might remember them - The Righteous Brothers. Ironically, my last email to my friend - which he never received - was to tell him of the passing of Bobby Hatfield the day before Larry crashed. 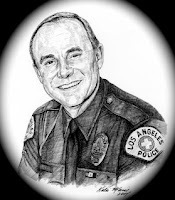 Larry spent more than 30 years as a proud member of the Los Angeles Police Department, a job he loved and through which he made thousands of friends. At his retirement celebration a few years ago I watched as man after man stood and told the assembled guests that Larry had been his best friend. That was the kind of man he was - one who was considered by many as their best friend. The last half of my friend's career was spent as the Athletic Director at the police academy, where he created and oversaw fitness programs for the officers during training and after they began their careers on the job. He coached and participated on the swimming and water polo teams, played on their football team and became a mentor to many along the way. He and his partner at the academy, Chuck Foote, created and conducted the Baker to Vegas Challenge Cup Relay - the premiere team relay race in the world - in which teams comprised of thousands of public safety representatives from around the world competed. He passed away a few months before the 20th running of that race. After his passing an award recognizing the most dedicated volunteer was created in his name. I found it ironic that his life ended in Las Vegas, the site of so many of his successes. HE WAS THE "TOUGHEST COP ALIVE"
He was a member of the Board of Directors of the California Police Athletic Federation, which conducts the Western States Police and Fire Games and the World Police and Fire Games. That role took him around the world, helping to conduct those festivals of athletic prowess. As part of this role he created an event he initially called the Toughest Cop Alive (TCA). This event is similar to a decathlon, except all the elements are completed in one day - a true test of skill, strength and stamina. Included in those elements are eight separate tests in which competitors must run, swim, lift, climb, throw and complete an obstacle course. That event, with a bow to political correctness, is now called the Toughest Competitor Alive, has been named for him - "Larry Moore's TCA". At Larry's funeral, on that dreary morning just few days after Christmas five years ago, I tried in the brief time allotted to me to tell the crowd in the packed church a little bit about my friend and our relationship. I did my best, but found it impossible to compress more than a half century of admiration, love and friendship into a few moments of dialogue. At that service we listened to his eldest daughter, who followed him into a career with the LAPD, speak of him in terms of loving admiration even though they had been estranged for a decade. During his hospitalization she made several trips from her home in the Los Angeles area to Las Vegas to see him. Her final trip was a spontaneous dash across the desert which resulted in her arrival at Larry's bedside shortly before dawn on a day when a conscientious nurse had modified his medication to raise his level of consciousness. Even though he could not speak, he was able to communicate through the firm squeeze of his hand, the nod of his head, crinkling of his brow and tear-filled smiles. In the pre-dawn hours that morning, in the trauma intensive care unit in a hospital in a city far from home, he reconciled with his daughter. Today, as I remember my friend and what he meant to me throughout my life, I leave you with this thought. Life is too precious and precarious to leave unfinished issues with your loved ones. Don't wait until it's too late, as my friend almost did. On this road of life you just never know what awaits you over that next hill. The road on the other side may be wide, smooth and straight, or it might hold a hidden turn, as it did for my friend. As we approach Christmas, do yourself and your loved ones a big favor. 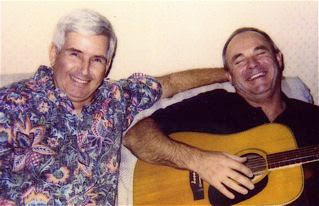 Remember my friend, Larry Moore, and make a resolution you can keep - resolve to tell those you love just how you feel. Do it now. Both you and Larry were very lucky to have each other. Thanks for reminding all of us that enjoy your writings, just how important every breath is and how close we need to keep your loved ones. Thanks for being my friend. Geoff, again - thank you for sharing, it puts things in perspective. Nothing better than remembering those who impacted our lives. Like Mike S. said, he was lucky to have a friend such as yourself. Geoff, Well said and from the heart. Geoff, a very moving reflection. What good man he must have been and what a great friendship you must have had. Thanks for sharing. As your sister I can only remember Larry with loving fondness. He was such a happy guy. I never remember a temper or even a negative comment from him. He was like my other big brother. All of us in the family loved Larry. Thanks to each of you who took time to comment here and via email. Take time this holiday season to share your love. So true. We are not here for very long and too much sadness comes from hanging on to the bumps and hurts that are part of life. Mr. U. Know-Who Gets It Wrong - Again!